At the end of your turn, Haskill chooses a cost. When you play a card with the chosen cost, draw a card. Then Haskill chooses a new cost. 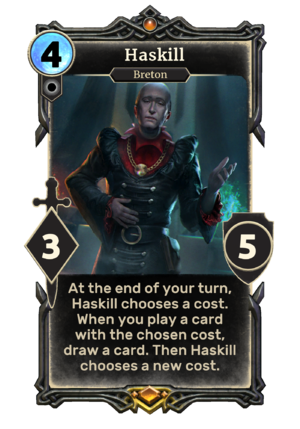 Haskill is a unique legendary Neutral creature card. It is part of the Isle of Madness story set. "Summoned again? I applaud you." "I assume you're having fun?" The number Haskill chooses is at random between 0 and your max magicka (or 12, if your max magicka is over 12). The UESP exclusively revealed this card prior to the release of Isle of Madness. Haskill previously appeared in the Shivering Isles expansion for Oblivion. This page was last modified on 25 March 2019, at 11:59.